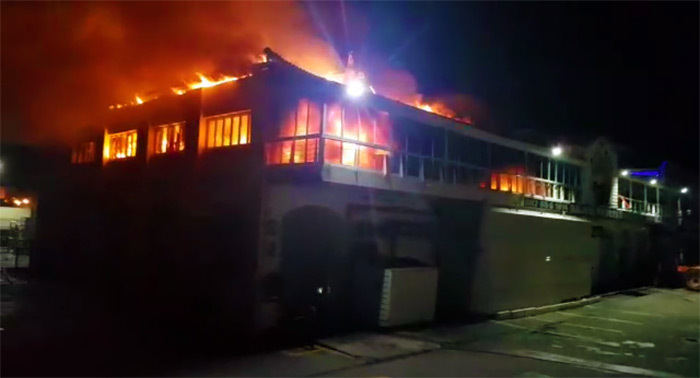 Fire broke out at a popular Port St Francis restaurant shortly before mid-night last night. Fire once again interrupted the peaceful lifestyle we so enjoy in St Francis when shortly before midnight the popular Port St Francis restaurant, Indigo Moon was razed to the ground. According to our sources Both NSRI, St Francis Disaster Volunteer Group as well as the St Francis Fire Department were alerted at around 11:30 last night with the fire department immediately dispatching vehicles and fire fighters. Unfortunately the fire was well set by the time the fire services arrived and all efforts were aimed at containing the fire and protecting the rest of the port buildings and businesses. By 12:30am the fire had been contained with fire fighters standing by to ensure no flareups threatened. The cause of the blaze is unknown at this stage but thankfully no one was injured and other than damage to some of the adjoining businesses the majority of the precinct was saved from damage. action was needed, he was a fire-brigade on his own! his were bringing him fire-extinguishers so that he could finish the job. have been a bigger disaster. His name is Stephan Rautenbach and he lives somewhere in St. Francis.